NCC offers visitors the superb and breathtaking views of majestic Himalayan peaks including Everest range, Numburchuli, Gaurishankar, Jugal and Langtang Himal ranges, pristine nature and unspoiled culture. 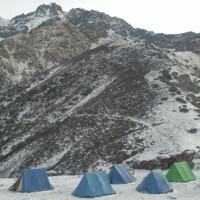 NCC is mostly an eco-lodge camping trek in addition to the unique home-stay experience among Sherpa communities. NCC welcomes both domestic and international visitors. 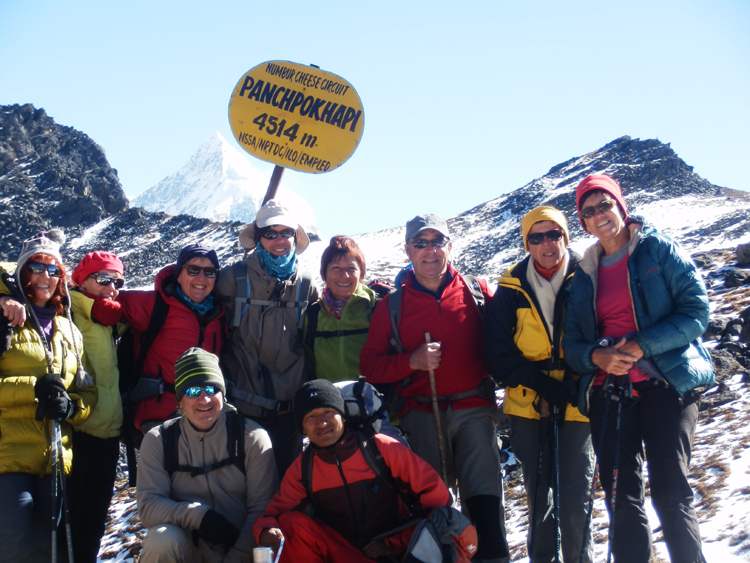 The trek encompasses a variety of terrain- deep river gorges, glacial lakes, terraced rice fields, temperate to alpine vegetation, and Sherpa villages to the towering peaks of Bigphera Go Nup (Pathibara) and Numburchuli. 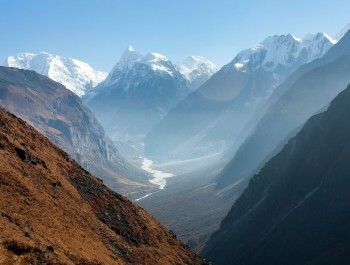 One can also observe Yak Cheese factories and the famous Thodung Monastery on the way. In March and April, rhododendrons bloom in profusion and eagles, musk deer and Himalayan Tahr are a regular sighting! And with a lot of luck, you can catch a glimpse of the elusive snow leopard.“Leave only footprints behind you, and take only memories when you leave” This concept of sustainable tourism is based on the premise that cultural and natural assets of destinations should be preserved for future generations as well. When planning this trek, great care has been taken to ensure the wilderness in the northern portion remains intact and that eco-friendly campsites instead of lodges and trail improvements have been incorporated. 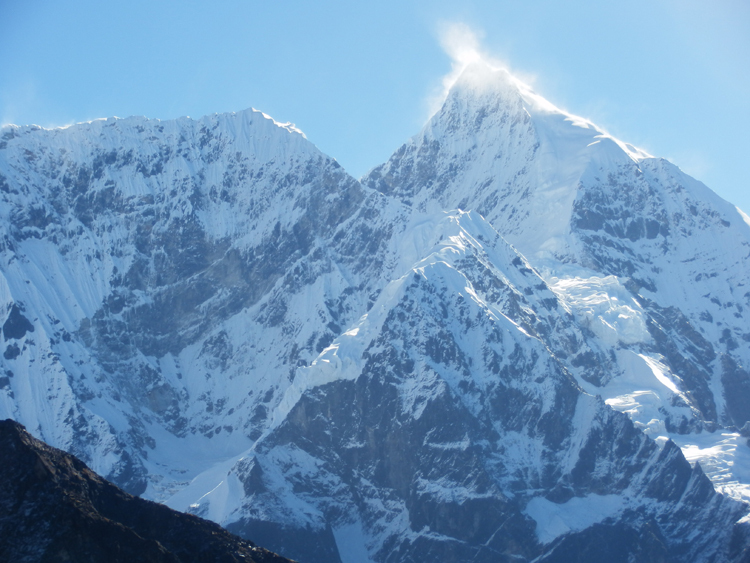 The ‘NCC’ is popular not only for the unclimbed Numburchuli peak, which at 6,959m is the highest peak in the area, but also for local products such as yak cheese, high altitude tea and organic potatoes. Often named ‘Slow Food’, these products are produced by local farmers and entrepreneurs and consumers take the role of co-producers. Likewise rainbow trout and plum are other potential slow foods on offer. The NCC can also be a part of the ‘Great Himalaya Trail’ connecting the Rolwaling and Everest region. NCC could be a genuine choice for wilderness seekers who are in quest for a circuit trekking package in relatively less visited areas. Visitors can experience the serene natural environment in two hidden valleys combined with exuberant cultural rituals. Trekkers can also reach up to the south face glacier of Numburchuili and hike through deep river gorges, terraced rice fields, temperate and sub-alpine forests, high summer pastures and experience a glacier walk on Lhiku valley. Soft to adventurous eco-camping trek, rock climbing, high Himalayan wetland observation, wilderness walking through the deep forest, glacier walk, base-camp trekking, high pastures and Yak cheese experience, Sherpa and Newar cultural experiences, spiritual rests at monasterys, biodiversity and climate change study, interaction with typical rural people through home-stay and if organized well in advance, some adventure sports like rock climbing and mountain biking would be some of the featured tourism activities in NCC. The mountain views are sensational and the Panchpokhari pass (4605m) and Gyajo La (Thulo Lapcha) pass (4880m) involve the most dramatic passes with views extending north into Tibet and south to Pikey Peak. 1. Exciting driving through the mountain: From Kathmandu –Dolalkhat-Jiri-Shivalaya. 2. 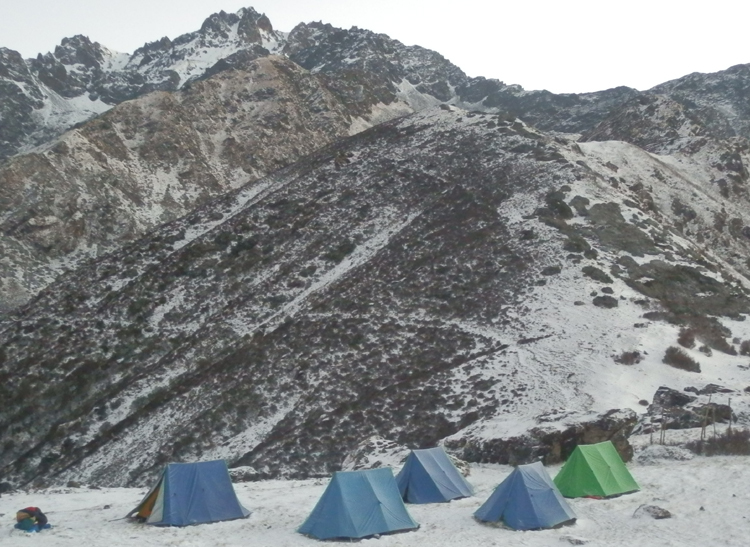 Eco-camping: Panipakha, Manedanda, Panchpokhari, Tare and Ngeju. 3. Home-stay experience: Khahare, Lhachhewar, Kyama and Gumdel (Sherpa), Lapchane (Newar). 4. Soft trekking:Shivalaya-Khahare-Manedanda section, Ngeju-Lhachhewar-Serding-Those section. 5. 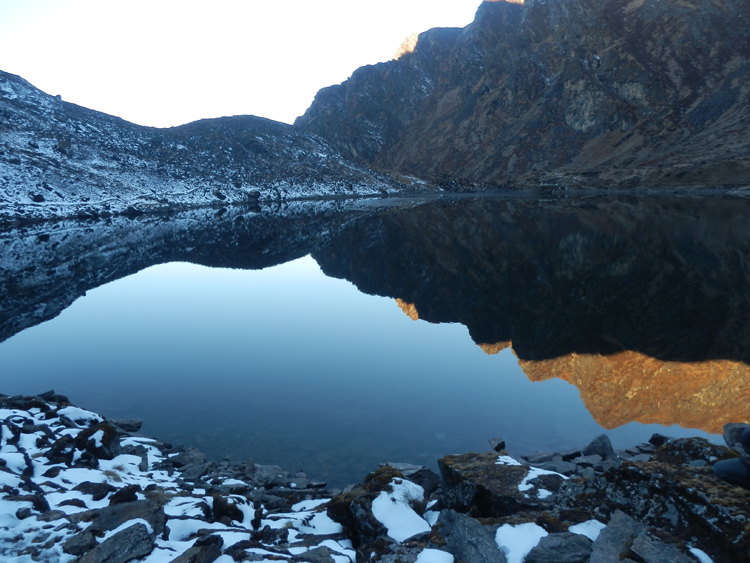 Adventurous trekking: Manedanda-Panchpokhari-Tare section, Tare-Gyajo La –Ngeju. 6. Rock climbing: Around Panchpokhari, Kholakharka and Dudhpokhari. 7. Ice climbing: Around Likhu Nup and Likhu Glacier. 8. Glacier walks: Khola Seer, Linkhu Nup Glacier, Bigphere Go Glacier, Surmoche Glacier, Likhu Glacier. 9. Peak observation and base camp trek: Sarmoche peak (5255m), Ramdung peak (5930m), Chukyima Go (6259m), Bigphrea Go Nup (6666m), Paniyo Tapa (6696m), Paniyo Shar (6549m) and Numberchuli (Shorong Yul Lha (6959m). 10. 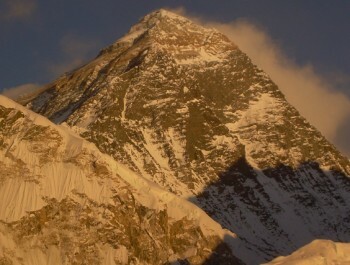 Peak climbing: Ramdung peak (5930m). 11. Sunset view observation: Panipakha, Phokte, Manedanda, Panchpokhari pass, Ngeju Kharka, Serding. 12. Observing Yak Cheese production process: Yak and Chouri pastures at Khahare and Khimti River, Likhu Nup River, Likhu River, Serding and Thudung (March to November. 13. Slow food experiences: Cheese, potato, barley, mushroom, other wild food. 14. 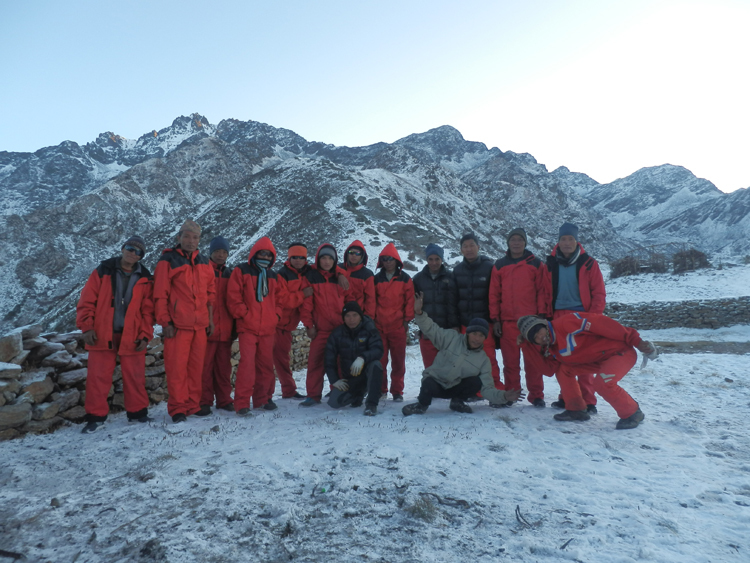 Sherpa cultural experience: Khahare, Lhachhewar, Kyama, Gumdel and Serding. 15. Monastery visit: Lhachhewar, Kyama, Gumdel and Thudung. 16. High altitude wetland study: Baulahapokhari, Jatapokhari, Panchpokhari and Dudhpokhari. 17. Forest walks: Panipakha-Phokte-Manedanda section, Ngeju-Lhachhewar section, Gumdel-Serding-Thudung section. 18. Bio-diversity study: Temperate to alpine vegetation types, rhododendron, conifers, birch, colored pasture grasses and NTFPs. 19. Wildlife observation: Redpanda, Musk deer, Himalayan Thar, Himalayan Mouse (Picca), hivalaya-Khahare-Manedanda section, Ngeju-Lhachhewar-Serding-Those section. 20. Pilgrimage visit: Jatapokhari and Panchpokhari festival, Monastery visit (Thudung), Uma-Tirtha temple (Kashi of the Himalayas) at the confluence of Likhu and Nupche Khola. 21. Side trek: Interesting side treks Baula Pokhari, the isolated valley of Khola Cire, and the natural Buddhist shrine at Kau Gumba up. Primarily designed for eco-camping experience, the NCC is a 14 to 16 day circuit trek starting at Shivalaya and ending at Those, Ramechhap. Highly experienced and short duration visitors can customize the NCC package to less than and up to 13 days, particularly by skipping overnight stays at Panipakha, Gumdel and Those. 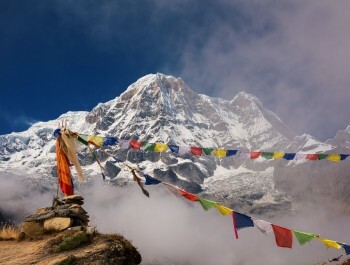 Interesting side treks of the ‘Numbur Cheese Trek' include Baula Pokhari, the isolated valley of Khola Cire, and the natural Buddhist shrine at Kau Chorten near Ngeju. 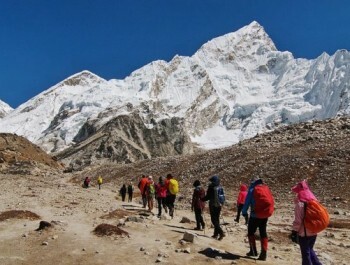 NCC could also be a strategic launch for an adventure trek to Rolwaling region via Likhu Nup glacier and to the Everest region via Kalla Pass below the Ngeju Kharka. Besides these itineraries, various customized packages can also be developed as per the interest and time of the visitor. This trek is a real expedition into a wilderness area, with strategically located eco-camping sites. The trek can also be done in reverse. An 8-9 hours drive from the capital city Kathmandu brings you to Shivalaya, the gateway to the Everest region as well as the NCC. Shivalya lies on the Khimti Khola River valley withlodges and a trek info center. 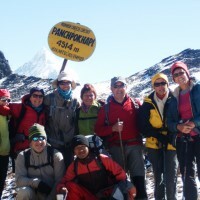 Local trekking guides can be arranged at Shivalaya. The town has a busy and well-stocked bazzar for trekking supplies. Enjoy a cold river-cooled beer and yak cheese on the lodge verandahs before beginning the trek. The trail from Jiri to Shivalaya on the other hand is part of the classic Sir Edmund Hillary route to Everest. 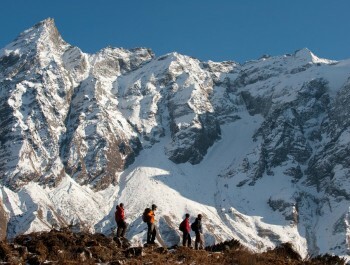 Day two is a leisurely four-hour trek northwards along the Kimti Koala River to Khahare village. Just beyond Shivalaya, the valley opens up to allow views of the first snow-capped peaks of the Rowaling Himal Range, whose visibility becomes crystal clear in the next 6 to 7 days. The trail runs up and down through terraced fields, crisscrosses the river and then snakes steeply up a cliff. Khahare village comprises of less than 5 houses, inhabited only during the winter by herders who spend their summer on higher pastures tending their Yaks. Enjoy your night at a home-stay with a Sherpa family and taste a variety of dishes made of Yak cheese, potato and barley. Be prepared for an adventurous trek and eco-camping ahead. Enjoy wilderness trekking along the Khimti River and at Panipakha find your first eco-camping site amidst scattered yak/chauri sheds and towering pines. Enjoy majestic sunset views from Panipakha. Continue to snake your way up as the trail ascends through conifer and rhododendron forest before leveling out in the summer pastures of Maanedanda . A flattened ridge, Maanedanda offers spectacular views of thick green jungle carved by numerous steep waterfalls on both sides. Next the trail makes a climb towards Jatapokhari and as altitude increases, the alpine pastures give way to scrubby forests of Sunpati, a rare mountain herb. The path by the river reaches a dramatic waterfall that signifies their arrival at Jatapokhari, a holy mountain lake perched in the lap of Panchpokhari Danda. The lake is a popular pilgrimage destination where over 3000 pilgrims gather to celebrate Janaipurnima (during August) every year. It is believed that taking a dip in its holy water will fulfill one's wishes. An overnight stay here is recommended to allow for acclimatization. Take a side trip to Baula Pokhari or "Mad Lake" but don't disturb the spirits within or your wishes may not come true! 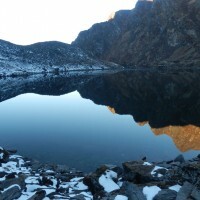 In sum, there are five small lakes, known collectively as Panchpokhari, within this huge glacial cirque regarded as precious high altitude wetlands. Sunset views of the mountain peaks of Numbur and Parchemo are not to be missed from here. Enjoy camping accommodation at Jatapokhari. The morning trek will be a challenging one as you cross over the Panchpokhari Pass at 4,605m and climb up to the base camp of Bigphera Go Nup (Pathibhara). This is followed by a glacier river walk to Tare. The Panch Pokhari pass offers spectacular panoramic views of the Rolwaling, Numbur and Everest ranges.The trail and views of the Himalayan peaks, glaciated valleys and folded hills to the south are breathtaking. Enjoy the scenic landscape at Kholakharka or do some rock climbing. Interested visitors can make their overnight stay even at Kholakharka. Over the white river (Nupche) cross the yak pasture and enjoy fresh cheese. Observe the golden Bigphera Go Nup (Pathivara) during sunset before setting into a wilderness camp. For anyone with an extra day, a side trip to Bigphera Go Nup base camp and glacier, Khola Seer (4469m) and Linkhu Nup glacier is worthwhile. Plan your trek wisely to visit beautiful Luikharka, Linkhu Nup Glacier, Bigphera Go Nup glacier and Panga Dinga glacier. If you are lucky enough, you will see Himalayan tahr, and even snow leopard.Go up to the base camp or see the up-close view of Ramdung, Chukyima Go and Bigphera Go Nup. Horses can be rented during the grazing season to take you further up the pastures and into Khola Seer where the impressive Lhasa Lake (4469m) remains hidden. 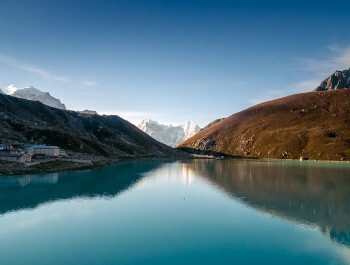 This vast, remote lake boasts an amazing Tibetan panoramic backdrop that is sure to leave a lasting impression. The most strenuous section of the Numbur Cheese Circuit, specifically the trail from Tare to the Likhu Khola valley is one that is both challenging as well as rewarding. The mountain views extending north into Tibet as you cross the Gyajo La (Thulo Lapcha) at 4880m, traditionally used by local Sherpas to bring yaks across the mountains, are sensational. gradual decent to Thulo Lapcha brings you to the seasonal Kharkas of Lakhedanda (4315m) in the Likhu Khola valley. "Wilderness" is the only apt term for the wild and rugged basin of the Lhiku River valley where you might even catch a glimpse of the elusive snow leopard. From Lakhedanda take in striking views of Dudkpokhari or 'Milky Lake' surrounded by tumbling glaciers like Surmoche and Likhu glacier and large moraines. The trek down from the Likhu glacier follows the turbulent Likhu Khola River until you reach the remote yak pastures of Ngeju (3690m) nestled by the river. Here you`ll find two more cheese factories and numerous chauri sheds dotted alongside the river. A short side trip up from Ngeju is the ancient Buddhist Shrine of Kau Gumba lying above the tree-line in the upper Likhu Khola Valley enclosed by a great sweep of high rock and snow peaks. From Ngeju the trail weaves through thick ancient forests alongside the Likhu Khola re-emerging into the remote civilization of Sherpas in Lhachhewar. Lahchhewar 'often called Chhewar' is one of the most beautiful Sherpa villages in the upper Ramechhap region, with astonishing landscapes, cultural wealth, and hospitable Sherpa people. 'Chhewar' offers unspoiled Sherpa culture where people still maintain their traditional way of life. 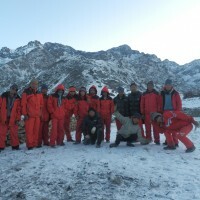 Enjoy again the Sherpa culture with home-stay accommodation. TThe trail follows the Likhu Khola River valley, descending through deep forest to Kyama with good views of Bigphera Go Nup and Numburchuli. Just at the confluence of Likhu and Nupche River, you will find Uma-Tirtha temple, widely regarded as KASHI of the HIMALAYAS. Enjoy the natural chanting sounds of deer and varieties of birds around Kyama. Visit an artistically painted monastery and experience Sherpa home-stay with cultural performance, too. With the glistening Numberchuili as the backdrop, Gumdel is a tiny hamlet gathered around a large Buddhist Stupa. The Gumdel home-stay offers the best of Sherpa hospitality and cultural traditions amidst a luxuriant landscape and spectacular mountain scenery. From Gumdel, the trail either descends through the mountain terrace along the Likhu River finally meeting the Everest trail at Bhandar or ascends through the dense forest finally reaching the beautiful Serding (3360m). Enjoy densely folded temperate and subalpine forest with a scenic view of Bigphera Go Nup, Numburchuli, and Kalla pass/danda as a backdrop. Enjoy fresh yak cheese in the serene environment of Serding. At sunrise, don’t miss to see the unique view of Gaurishankar from Serding or from Punnasa view point. Descend gently to observe one of Nepal’s first yak cheese factories, established in 1957 along the way to Thodung. Visit the nearby monastery and get a warm blessing from the lamas. Thodung Monastery is a large, active monastery surrounded by aromatic pines, and a variety of flora that enhance the serenity of the monastery and its surroundings. Have your lunch with lamas at Thodung or stroll back down to Deurali which lies on the Everest trek. 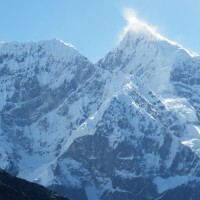 You will see a unique vista of Gaurishankar Himal from Ekanagi. Falamedanda (3105m), thirty minutes before the Newar village of Lapchane, is one of the tallest hills in Ramechhap from where you can see most of the central and eastern Himalayan peaks like Langtang, Gauri Shankar, Numbur and the Everest range.The hilltop also offers breathtaking sunrise and sunset views. The variety of flora and fauna, with 65 species of birds, makes it a fine place for nature lovers. In the evening, enjoy Newari culture and tradition with home stay accommodation at Lapachane. Enjoy sunrise views from Falamedanda/Tame and gradually descend down on your last day at Those. Before the construction of the Jiri Road, Those was the busiest market town on the trade route between Namche and Lamosangu. Sit back and relax by the river and perhaps look through your photos with your guides. Drive back to Kathmandu through the mountain terrain. * 4 nights accommodation in twin bed sharing basis with breakfast at standard hotel in Kathmandu. * Sightseeing trip in Kathmandu Valley as per above mentioned itinerary and all entry fees.